I am a 50-something libertarian-conservative, 2nd Amendment advocate who believes in the principles this country was founded upon and who is angry that we have gotten so far away from them. I am a pro-life individual who struggles with his faith and who isn't afraid to write about it. I hope that what I blog about has a positive effect and also hope you can find in your heart to pray for me and may God bless you for it. This blog post makes me ashamed and angry on many levels, I do not believe I could be as courageous in the face of death. This shames me and probably many others who will choose to remain silent. The anger comes from the attack happening and being ignored by the mainstream media after an initial halfhearted report. We all understand in this fallen world that evil exists and there are going to be martyrs, but this is doesn’t excuse what happened. The fact that I was unaware of what happened until today tells me that coverage was minimal at best. The post below angers me because the truth sometimes hurts. I am ashamed by the depth of my belief and sometimes despair I will ever change. I will admit I have always desired a deeper faith but have been unwilling to put in the work and effort required. Although I can attest to the power of prayer as I can now walk when Doctors and Physical Therapy seemed to feel that I had reached maximum improvement with just limited ability to walk. I had many people tell me they were praying for me to be able to walk independently, I wasn’t smart enough to know when to give up so I can walk better than staff ever thought I would be able to do. I am just telling you this so that you can understand I have no excuse for my spiritual laziness. I read stories like this and I want to almost weep in shame, but I don’t and wonder that I am not alone in this judging by what I read in the Christian/Catholic press. Please read the post below and I hope that you can take something positive from what the author writes. I am amused by the innocence of these early magazines, but also saddened when I realize what has been lost. We have become so jaded by the intervening years. One thing however, hasn’t changed Eternal vigilance is still the price of freedom and I am afraid our accounts are severely in arrears. Our schools will be no help and are a large part of the problem in that they have not been teaching about our American heritage the way they should. But read for yourself how far we have strayed. In a much longer recent entry I questioned the common narrative that the National Rifle Association was (largely? mostly? considerably?) a-political prior to the 1977 Revolt at Cincinnati. Continuing my stroll through 100 years of the NRA’s flagship publication, The American Rifleman, I came across still more evidence that the fundamental political emphasis of the NRA has been to protect the Constitutional rights of law-abiding gun owners (that pesky Second Amendment). 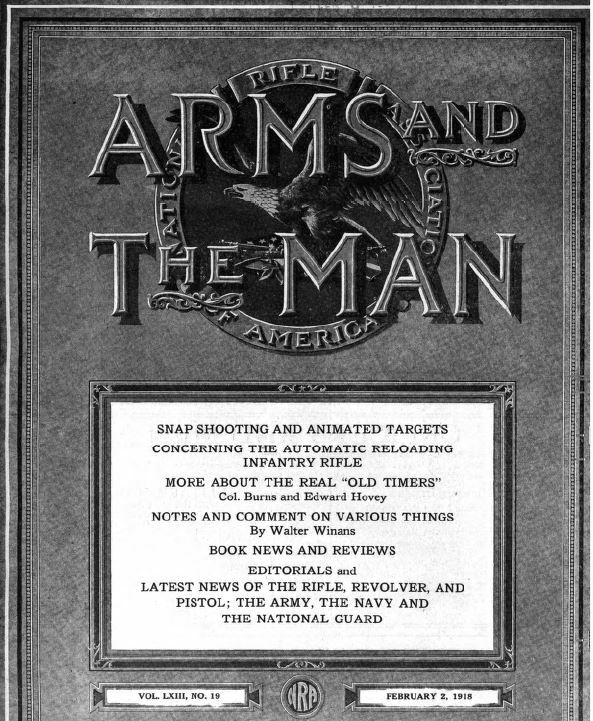 Case in point: the 2 February 1918 issue (back when the magazine was still called Arms and the Man).